Based in West Bromwich, we provide professional mole catcher services across Birmingham, Sandwell, and Walsall. Contrary to popular belief, moles are not rodents. They are insectivores. These small mammals spend their entire lives below the surface of the ground, tearing up lawns and gardens in an endless quest for food. 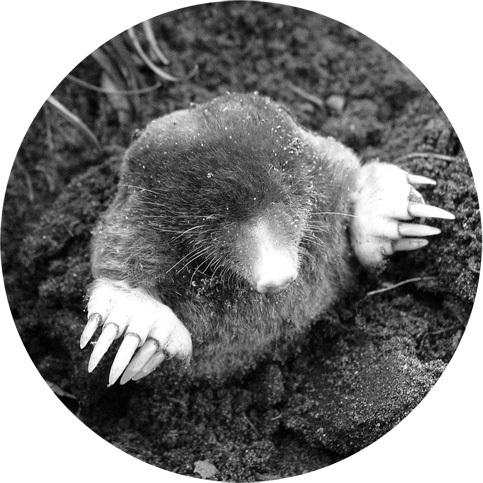 As moles tunnel beneath the earth in search for food, they create extensive networks of surface feeding tunnels at an alarming rate of up to one foot per minute. All that tunnelling causes damage to the root systems of grass, flowers, and vegetables causing them to turn brown and die. When moles are present, it is not uncommon to see linear pathways of brown dying grass throughout your lawn and increasing numbers of plants succumbing to the lack of nutrients caused by the damage done to their roots. In their hunt for earthworms and grubs just beneath the surface of the ground, they excavate soil from their tunnels and deposit the dirt on the ground. These shallow tunnels result in surface tunnels that are identifiable by the areas of raised ground which appear as long ridges in the soil. Shallow tunnels feel spongy and soft when walked on and can cause people to trip, fall, sprain an ankle or worse. Mole runways often follow along a house foundation, driveway or lawn border. Open holes to the surface are rarely seen. Moles also dig deep tunnels to provide a year long food source. These creatures are not bothered by winter cold. They simply dig a bit deeper into the ground. More importantly, moles do not hibernate. They monitor these tunnels for food sources burrowed within them. These deep tunnels appear on the ground surface as conical or volcano shaped mounds that are uniform in shape, though they may differ in size. Mole mounds, which are the result of deep digging, quickly kill grass. On the one hand, moles are a sign that you have a healthy lawn or garden with plenty of great soil; but on the other hand, these destructive pests will cause costly damages. Don’t let moles destroy your beautiful lush, green lawn that you have poured so much time and effort into. We specialise in humane trapping, we employ humane practices and avoid causing unnecessary suffering to a mole at all times.